I had this vision in my imagination of a person walking on the soil. As they walked they started to crumble like dirt. As the person crumbled they went into the soil and became roots and literally grasped onto the soil. As this person grasped the soil a tree burst forth and grew. Thinking of this again I see fruit and others coming to eat of the fruit of the tree. Interpretation: The person is a believer. The crumbling is the process of deny of self and the body of sin being done away with. They became good soil. 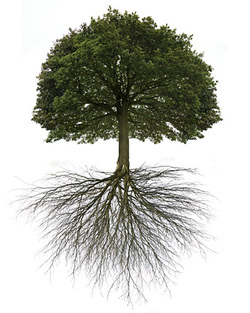 Roots were established by love and gave birth to a tree with fruit. This fruit was provided for nourishment of those around. Fruit is meant to be eaten. The fruit of the Spirit is meant for others. Knowing Him intimately is key. Revelation was birthed by John’s position at His heart. Oh to be called “the disciple who Jesus loved!” Knowing Him and His love in the depths of the soil of your love will determine how grounded you are and the heights you’ll attain. In order to be beloved you must be loved. Be lavished with it. Be overcome with it. Get wrapped in the bliss of Agape. Father, we come to You, Love Himself, and ask that you wrap Your love around us. We accept Your love based upon Your full knowledge of our past, present and future. We receive Your love as the most accurate estimation of ourselves. Forgive us for false humility and not rooting and grounding ourselves in Your love. Forgive us for trying to stop the flow, like we could stop your love. Enrich our soil. Plant. Water. Father, give increase. Teach us to love! Help us to be the opposite force of hate in our lives and this world. Root us and ground us in Your love. Help us to be loved. Forgive us for hating ourselves and our neighbors. Heal us, Father, from the wounds and arrows. Let Your love overwhelm us. I love the prolific overflow of the Holy Spirit in your life dear brother! Nothing compares to the presence of the Living God when we are yielded to His unconditional love!